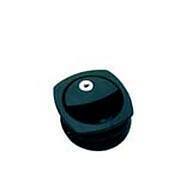 Caraloc Baggage Exterior Door Lock, Black, to fit 64mm hole. 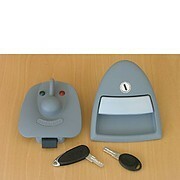 Hartal Door lock RH for Swift group caravans complete with barrel and keys. Hartal door lock RH for Bailey CaravanTriangle lock comprising inner and outer components and barrel lock with two keys. 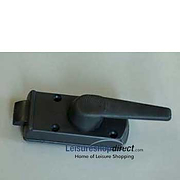 Hartal lock with black exterior handle. Right hand version where door hinges are on the right when viewed from the outside. 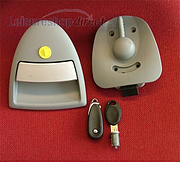 Hartal Door lock LH, for Swift, Abbey, Sterling and Ace caravans, complete with barrel and keys. 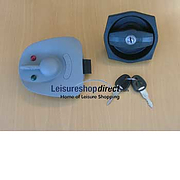 Hartal lock with black exterior and grey interior. Interior part only. ONLY WHILE STOCKS LAST. 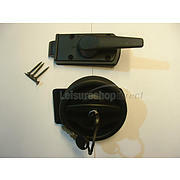 Vecam Lock Interior LH for Touring Caravans and Motorhomes. 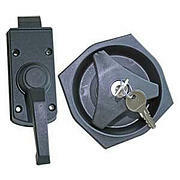 Left hand door lock kit. Supplied with two keys. Interior and exterior handles. 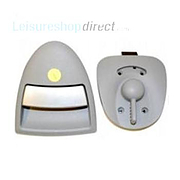 Approx dimensions: 110mm x 110mm x 110mm. 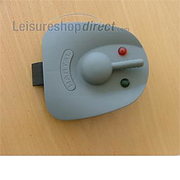 Designed for caravans/motorhomes.